Google found why people aren't eager to change their browsers: they don't even know what a browser is. Some think that the browser is actually a search engine, others are convinced that the only way to browse the web is to click on the big blue E from the desktop. To explain Internet Explorer users that there are better alternatives out there, Google started with the basics: a short introduction to web browsers. "The web browser is the most important piece of software on your computer because every web page runs though it," concludes Google's short video. 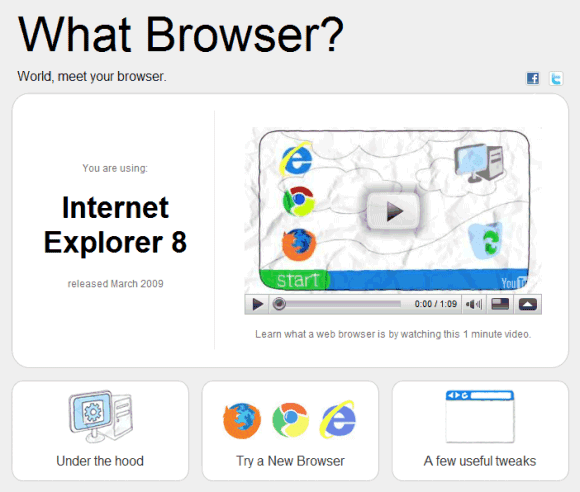 "A few of us at Google created WhatBrowser.org to help teach people about web browsers. We wanted to show people that they have a lot of choice in browsers, since we noticed that most people were using the browser their computers came with." "The browser their computers came with" is an euphemism for Internet Explorer, even though Safari is another browser that fits the description. I have met people that have this problem of not knowing the difference between a browser and a search engine. Thank you go giving me a video to send them. My question is why would you name your operating system Chrome OS? If people are already blurring the concepts of browser and search engine, why name your operating system after your browser? "the most important program on your computer is your web browser." And I thought it was the Operating System. Silly me. Does the ignorance of the average user is surprise anyone? Windows exists because 99% are to untech to handle anything that's not GUI. (Like NY Daily News is the 'picture newspaper' - for people who can't read LOL). They don't have a clue of what an OS is, much less various components and applications. Microsoft and the PC makers realized they could only sell a limited number of PCs running a command-line OS, but if you made operation so simple an idiot could do it, you'd sell a lot more - because there are a LOT of idiots. And you being one of them. Let's stop calling people who aren't comfortable with computer technology "idiots." My father barely knows how to get into IE and navigate to a pinochle game, and that's pretty much the extent of his computer abilities; however, he can also build anything from scratch, and fix nearly any automobile issue himself despite having no formal training - I have to pay others (who probably call me "idiot") to build stuff for me and fix my car, although I make my living in IT. Gifts differing and all that. Thank goodness for the tech un-savvy - they mean job security for those of us who make a living assisting them with computer issues. I'm rather grateful for them and their ignorance. In any case, having done a lot of training I've found that the issues which are the topic of this article are more attributed to a lack of interest than stupidity. Many people simply aren't interested in more than the basics of their computers. Hey, Did you guys check the last scene? The different icons of web browsers were actually buttons. That was pretty cool. No wonder people are confused if Google is telling them that "the Web browser is the most important piece of software on your computer". And isn't it ironic that for a company named after a search engine, who then started building a browser and operating systems (Chrome, Android, Chrome OS) around their search engine, are now going out of their way (I think the word is "condescending") to explain how those things are all different? I really can't understand why does Google keeps ignoring Opera. I agree with most of these comments. After this story broke there were so many articles, blog entries, and tweets about either how stupid people were or "how could anyone online *not* know what a browser is?" The people saying these kind of things clearly live in their own fantasy worlds and wouldn't know how to educate (or market) to others if their lives depended upon it. Google knows if they are able to grab the people that call the IE desktop icon "the internet" the browser wars are going to be over before they begin. I applaud the What Browser? campaign more than I've applauded anything Google has done in recent years. It's cool to market to insiders, but to not forget about the outsiders is golden. This wasn't done by Google. This was some user on Youtube that did it. Why did you think it was Google? The browser is just an interface wish parses and displays it..in the OSI model this is layer 7. Before a browser there was and still is; FTP, Telnet and other protocols that are still needed for a browser to function. There will be a time when a "browser" will be replaced with a true multimedia interface. Today we see a few examples of this in Flash based products. Some of you seem to fear how a site might grab your personal information, well try an IP masing tools such as, "Free IP Switcher" or for a few bucks per year try using a proxy service. This will pretty much assure you of a totally secure session. The Browser is merely a way for a neophyte to use the WWW. The Internet itself is more than web activity. VoIP and other telephony traffic, video services, email and more. One can send emails over the internet by the way WITHOUT a browser. In the end, we will see operating systems such as OpenVMS to be on more servers as it provides more security, flash based interfaces, visual interfaces that are not an HTTP/HTML based. HTTP is limited and was actually an Apple concept. HTML and XML will be here for some time but its already changed to support all media types. As for Microsoft, Microsoft destroyed the internet with operating systems that were never ready for prime time let alone the current server OS's (MS 3 and 7). Most bitching comes from those who use MS since they can never tighten up the security issues on the client OS. Apple has a better model, Unix based kernel and a solid performer. Lets be fair, the MOST IMPORTANT "application" on your computer is the operating system. Browsers will come and go.